Domonikke Orocio intercepted a pass with four seconds to play Monday to preserve Clark’s 12-7 home win over Foothill in the second round of the Desert Region flag football tournament. Foothill attempted a pass on third-and-goal from the 12, but Orocio picked it off to end the threat and allow the Chargers (19-6) to advance to meet Green Valley (23-2) in a quarterfinal at 4 p.m. Wednesday at Silverado. Jagayra Gomes’ 11-yard touchdown pass to Jaeda Centeno allowed the Chargers to take a 12-7 lead in the second half. Val Morquecho added a rushing TD for Clark. Allie Wiliams hauled in a touchdown pass from Brooke Lynch for Foothill (12-12). Tech 35, Durango 29 — At Tech, Taylor Ritayik threw three touchdown passes and ran for a score to help the Roadrunners hold off the Trailblazers in the Desert Region tournament. Ritayik completed 14 of 22 passes for 173 yards and rushed for 58 yards on seven carries for Tech (11-7), which will take on Sierra Vista (12-5) in a region quarterfinal at 4 p.m. Wednesday at Coronado. Erin Adarve threw a touchdown pass and caught another for Tech, which also got two TD catches from Adriana Carrillo and one TD catch from Madison Bennett. Nayeli Silva-Kahalewai threw for 215 yards and three touchdowns for Durango (9-10). Dezirae Castillo, Autumn Spiezio and Kamaile Kuhiiki each caught a TD pass, and Tatiana Baes ran for a score for the Trailblazers. Basic 26, Desert Oasis 20 — At Clark, the Wolves built a 20-0 halftime lead and held on to edge the Diamondbacks in the Desert Region tournament. Basic (3-15) will visit Silverado (13-2) in a region quarterfinal at 5:30 p.m. Wednesday. Makayla Rickard completed 21 of 46 passes for 241 yards and a touchdown and rushed for 101 yards and two touchdowns on 16 carries for Desert Oasis (2-12). 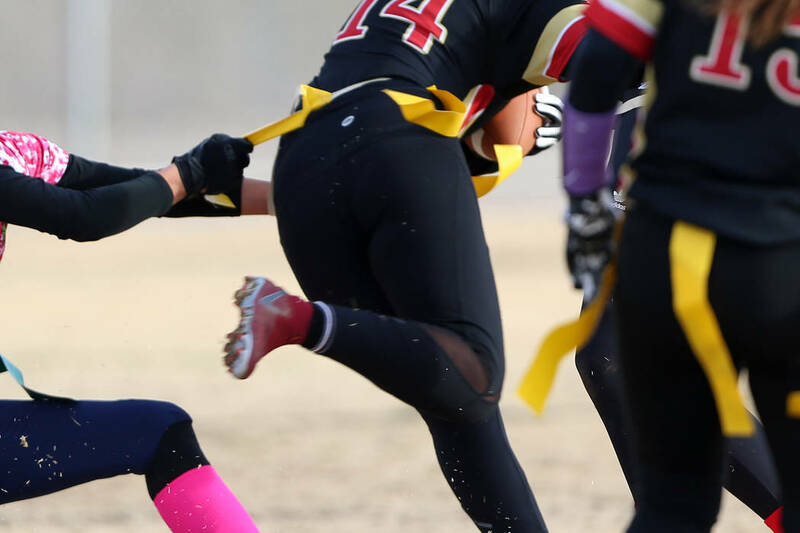 Emma Coleman caught Desert Oasis’ touchdown pass. Liberty 33, Spring Valley 6 — At Spring Valley, Jeslyn Siores was 12-for-20 passing for 170 yards and two touchdowns to help the Patriots defeat the Grizzlies in the Desert Region tournament. Arielle Meikie rushed for 105 yards and two touchdowns for Liberty (6-12), which will visit Coronado (14-4) in a quarterfinal at 5:30 p.m. Wednesday. Mai-Kia Williams caught two TD passes, and Jasmine Wafer returned an interception for a score for the Patriots. Samantha Guerra rushed for 106 yards and two touchdowns on 16 carries to help Shadow Ridge to a 26-6 win over Eldorado in a second-round Mountain Region tournament game at Bonanza. Mikayla Brown completed 20 of 25 passes for 240 yards, including a pair of touchdown passes to Rachel Gadeski for the Mustangs (11-9), who will visit Cimarron-Memorial (17-1) in a region quarterfinal at 5:30 p.m. Wednesday. Bonanza 24, Cheyenne 19 — At Bonanza, Charlene Beck rushed for 166 yards and a touchdown on 18 carries to lead the Bengals by the Desert Shields in the Mountain Region tournament. Cindylou Raisang completed 18 of 31 passes for 177 yards and two touchdowns and rushed for 49 yards and a touchdown for Bonanza (14-9), which advances to face Las Vegas (12-10) in a quarterfinal at 4 p.m. Wednesday at Cimarron. Alicia Kestner and Ashley Vasquez each caught a touchdown pass for Bonanza. Centennial 13, Desert Pines 12 — At Desert Pines, Shania Brathwaite rushed for a touchdown, and Denae Benites caught a touchdown pass to lift the Bulldogs over the Jaguars in the Mountain Region tournament. Centennial (6-7) will face Palo Verde (11-5) in a quarterfinal at 4 p.m. Wednesday at Legacy. Arbor View 32, Canyon Springs 6 — At Desert Pines, the Aggies defeated the Pioneers. Arbor View (5-14) will visit Legacy (16-4) in a quarterfinal at 5:30 p.m. Wednesday.